Microsoft’s Office Online paves the way for truly collaborative technology as well as several software programs including Microsoft Powerpoint, Word, Excel and others – all online! What is Microsoft Office Online? Microsoft Office Online implements the Office 365 package and can be accessed individually through an Outlook account. However, the business package extends those capabilities to your entire team and allows employees to work from their homes – collaborating with team members and ultimately moving a project forward, faster. How can I make Office 365 / Office Online work for my Company? With 4 Corner IT, we fully encourage our clients to take full advantage of all the technologies available to them. With Office 365 and Office Online – our clients can expand the work roles of their employees who before might have been confined to the computers in their workstation. With Office Online, however, project movement and team development is quicker, easier, and enjoyable because Office 365 allows you more work for less time. Create and share Office documents (Word Online, Excel Online, PowerPoint Online, or OneNote Online). 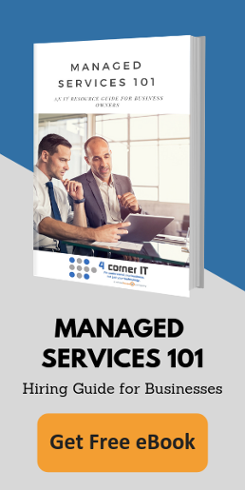 Call 4 Corner IT at (954) 474-2204 now to speak with a technical adviser about implementing this all in one technology into your company’s inner workings!